The 41st EAIR Forum addresses the responsibility of higher education systems in three main questions: What? Why? How? The Forum will look for answers on pressing questions, on experiences of universities, their members and their stakeholders, on lessons learned, discussions and exchange about the topic of responsibility of the Higher Education System. The tracks of this conference allow a variety of perspectives on this subject. This makes it possible to recognize the diverse excellence of the higher education system and higher education institutions worldwide. It is with great pleasure that we hereby announce that the 41st EAIR Annual Forum 2019 will take place in Leiden, the Netherlands and will be hosted by Leiden University. The higher education system and higher education institutions have had two main missions over the centuries: performing scientific research and teaching young scientists. In recent decades, the roles of the universities became more diverse. Not in the last place because society changed. Today we live in a knowledge society, in which knowledge is no longer produced exclusively in universities. Students are no longer being educated only for science, but also for professional roles in other public or private organizations. The university walls have broken up and a large number of tasks and missions have been added to performing research and teaching students. The higher education system is faced with an ever-increasing number of demands. Politics, society, economy and science have different demands on the higher education institutions. Global challenges and pressing social issues are addressed to the higher education system. Universities and universities of applied sciences are tackling these challenges. On the one hand they take over responsibility and on the other hand they are responsible. Higher education institutions take over responsibility for internationalisation, for society and for the labour market. In other words: for an innovative future. The higher education system is not only responsible for the development of its students and for scientific research, but also for the transfer of knowledge, technology and ideas. take over responsibility? And what does this all mean for the organization and administration levels? Above all, the question arises as to how responsibility can be assumed and how the universities deal with the manifold requirements, challenges and missions. 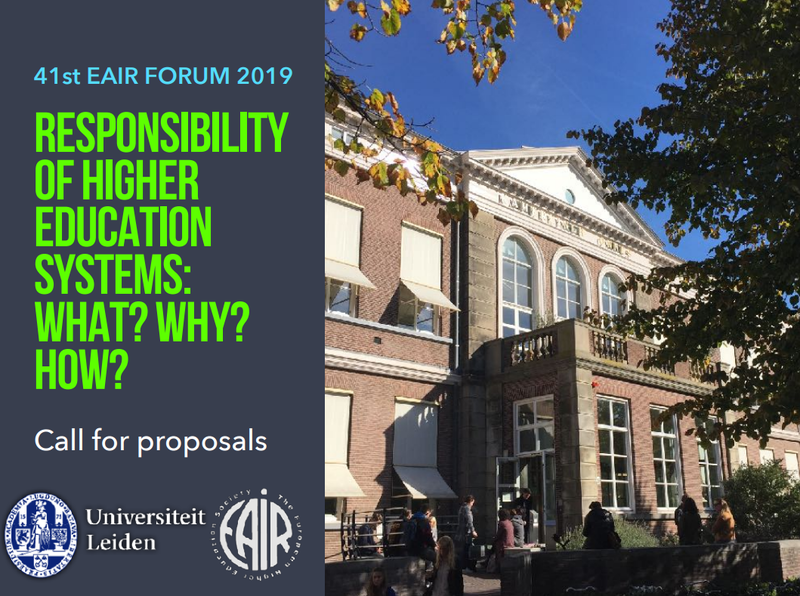 The 41st EAIR Forum addresses the responsibility of higher education systems in three main questions: What? Why? How? We are looking for answers on pressing questions, on experiences of universities, their members and their stakeholders, on lessons learned, discussions and exchange about the topic of responsibility of the Higher Education System. The tracks of this conference allow a variety of perspectives on this subject. This makes it possible to recognize the diverse excellence of the higher education system and higher education institutions worldwide.